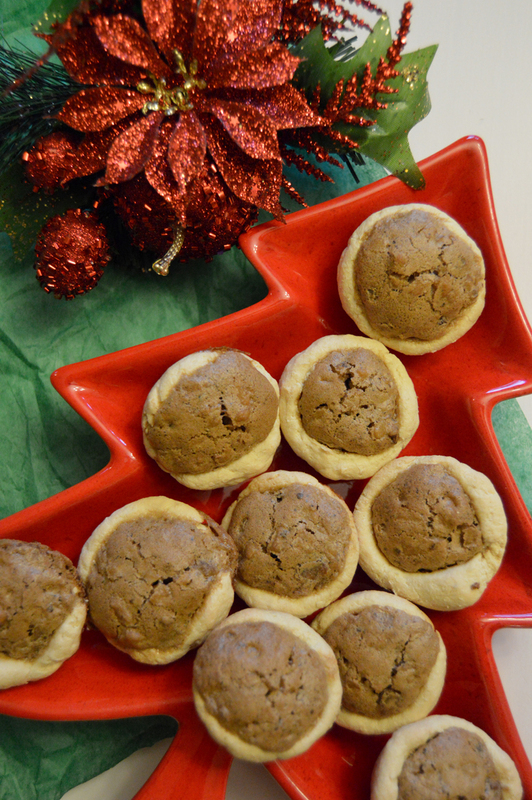 Mini Walnut Pies – And Pretzel Pies Too! I’m feeling pretty nostalgic these days. The things that are keeping me smiling through the last days of a horrifying 2016 are Christmas, New Year’s, the holiday baking, and the day we move into my dad’s house…my childhood home. Yes, we’re leaving the 13-year-old shoebox for a 100+ year-old house. It was the last item on the long laundry list of things to do in regards to Dad this year. We were able to sell his car without fail, and now, after 3 months searching for a lawyer who was able to call us back, one actually called us back, seal the deal, and we were given the okay to move in at any time. Now the challenging part: the stuff. We need time to go through, move around or move out, and clean the rooms. With our furniture, and Dad’s, we now have double the stuff! Our stuff, his stuff…OMG!!! So for now we’re in the “calm before the storm” phase since we are gonna wait until after Alex’s birthday to put on our work pants and get going. But for now, I still go over there to check the mail, maybe toss out some things that expired or have no use for, and empty out dresser drawers. There’s now a big stack of clothes on his bed, and I’m gonna have the men in the family go through them before they’re given to the local Goodwills. Besides the cleaning and moving, the other exciting but challenging stage of this move is the flipping. Interior and exterior, the house is going to get a facelift. Most importantly we gotta hire someone who is an expert with plaster so we can get part of the ceiling fixed in what will be Alex’s bedroom. No moving in until that’s done! So who wants to crawl up into the attic and check above the ceiling to be sure there’s no leak sneaking in?? Even these exciting moments are in fact during unfortunate circumstances, especially having to put Dad in a nursing home, it makes all parties involved feel good that the house is still going to be within the family. Mike and I are excited, but yet nervous, due to what we’ll be up against, but I’ll be making a return to the place where my baking obsession began, the tiny kitchen. Thousands of cookies and desserts came out of that kitchen with love and dedication. Mom taught me a lot in that little room with a quarter of the counter space that my current kitchen has. 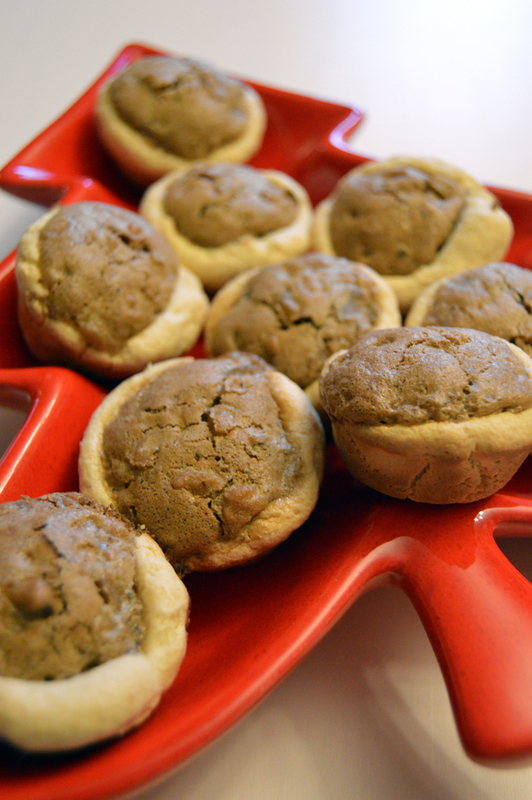 Which is why these mini walnut pies bring back memories of her and I making them together….or she was making them while I took a spoon to the walnut/brown sugar filling! These mini pies are the only time I’m all about eating walnuts the way they are, not totally minced up. I have a peanut allergy, and my taste buds never enjoyed the taste and textures of other nuts I’m okay to eat. Now that I have a child, I past down the peanut allergy to her, which was what I was afraid of. Then the surprising thing was the allergy tests came back saying she’s allergic to pretty much any nut that is out there: walnut, pecan, peanut, almond, you name it, she’s allergic. She saw me making the walnut versions and she wanted one, and I had to sadly tell her no and explain why. There was a bag of mini pretzels on reserve for another holiday treat on the countertop nearby and thought about taking about a cup of them, chopping them, and using them in this recipe as a substitute. Alex loves pretzels, and oh boy does she love these versions of these mini pies! If you can’t use nuts, there’s always a way around it! But if you have no nut allergy, by all means, add in those walnuts, or pecans, or combine them both! Tiny bite-sized pies that are sure to bring you back to the serving tray for more! You can also substitute chopped-up pretzels, or pecans, or combine them. Whatever makes your taste buds sing! • In a small bowl, combine the cream cheese and margarine together. • Add the flour and mix until well blended. • Cover the bowl and place in the refrigerator to allow the dough to firm up, 1 hour or so. • In another small bowl, mix all 4 ingredients together. • Preheat oven to 350-degrees. Spray a mini muffin pan with non-stick cooking spray. 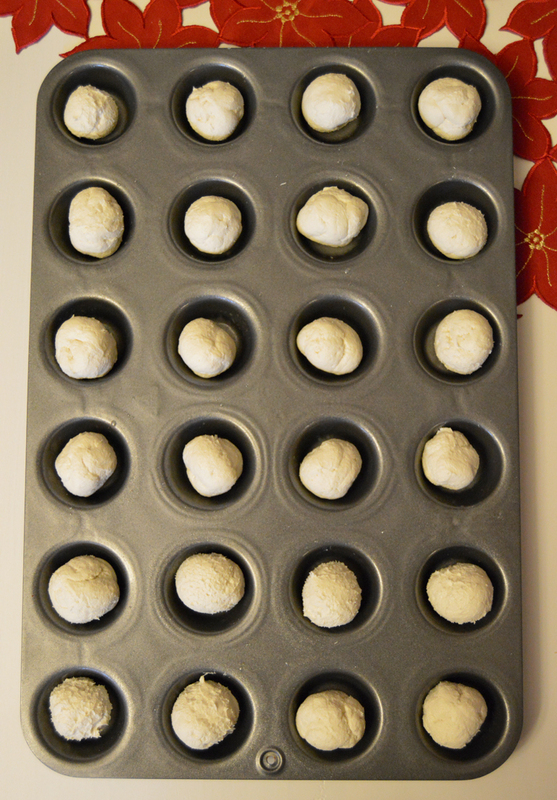 Take the chilled dough and roll up into 24 small balls and place inside each mini-muffin cup. 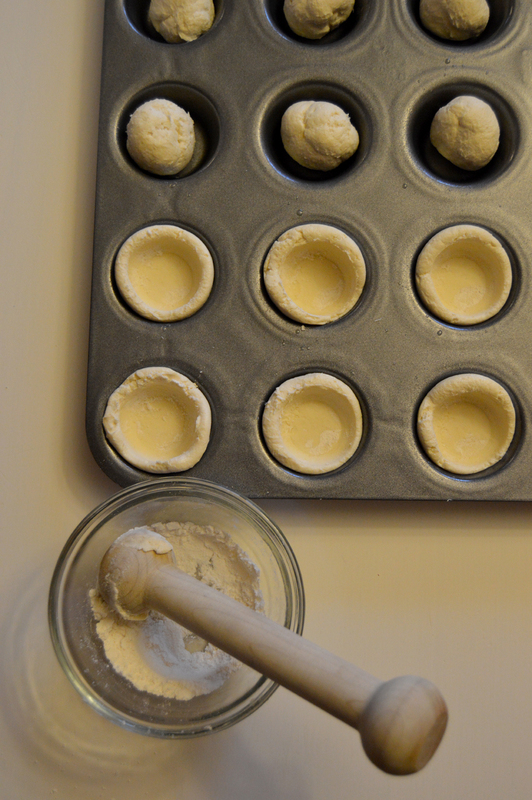 Take your thumb or a mini tart shaper and press down into the balls of dough to create a little bowl. To prevent your thumb or shaper from sticking to the dough too much, have a small bowl of flour handy to dip into it each time you create a bowl. • Take a small scoop of walnut filling and place inside each dough bowl. • Bake for 25 minutes or until dough is lightly golden. 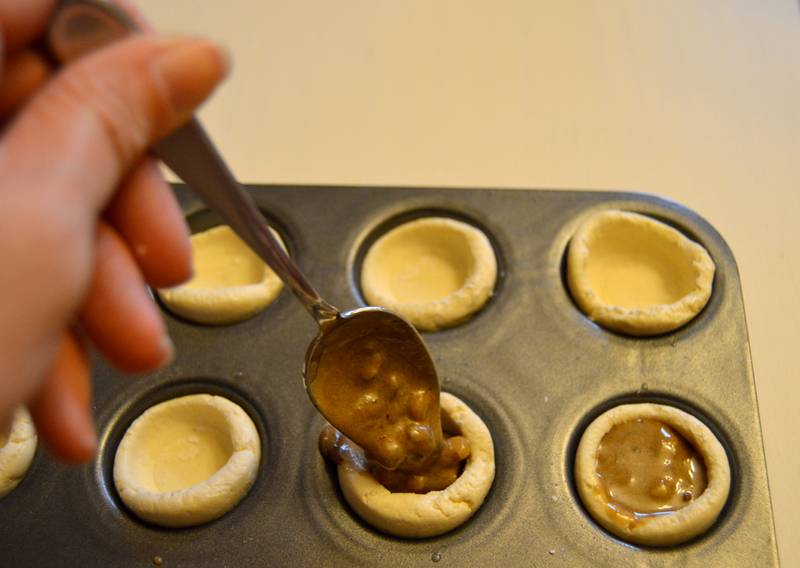 • Allow mini pies to cool slightly before removing them from the pan.